This is what the arrogant priest said in the National Assembly on Wednesday during a debate on a motion by Churchill Gill the elected member for Baie St. Anne. 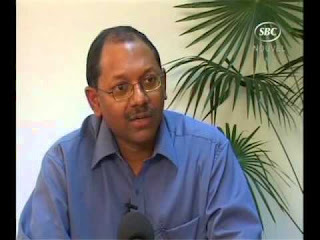 Wavel Ramkalawan was trying to seduce the electorates on Praslin most particularly the inhabitants of Baie St. Anne. He stated that his father was the first baby to be born in 1927 at the newly built clinic on Praslin, “I have Praslin blood in me”, he said. He also stated that his father was supposed to be on the ill-fated Mary Jane, if he hadn’t been late to catch the boat, which left without him. “I was meant to be born”, he insinuated that it was a miracle through God’s intervention that his father was not onboard the Mary Jane. In analyzing this statement by Wavel, it is clear that he is setting himself apart from mere mortals like us. And that his existence on Earth is as a result of the direct intervention of the creator; which makes him a prophet or a king for that matter. This was the thinking of people like Idi Amin Dada, Adolf Hitler, Stalin, Lenin, Mao Tse-Tung, Genghis Khan and the likes…. It is the mark of a very dangerous individual, a person who should never inherit presidential powers. You have been warned!! !